They're everywhere. You walk into a supermarket or corner shop and your senses are assaulted by colourfully wrapped bars that promise you everything from energy to weight loss. But are these hyped treats handy health foods or little more than candy in fine clothing? Mr. Bad Food decided to go bar hopping - with a little help from a few nutritionally savvy friends. Before parting with your pennies, bear in mind that the word 'energy' on any label simply means that the food supplies calories, not that eating it will make you more energetic. Those in the know suggest you stick to eating healthy, whole foods like fruits and vegetables. Why? Well, for one thing, natural foods contain the good stuff not added to most bars. Our nutritionist, registers a split decision. "But all meal replacement bars are not created equal. Some contain enough sugar and fat to be called candy bars. Others are extremely high in protein and that's unnecessary for all but the uncommon person who’s expending so many calories in exercise that more protein, carbohydrate and fat are called for. "For some people, dieting is easier when including these sweetened snacks, but often they're too low in calories to be true meal replacements." "As part of a healthy diet, meal replacement bars can satisfy your occasional craving. They can also help people maintain their prescribed calorie allotment for the day, whether they're trying to lose weight or maintain their weight. "Most bars won’t provide all the nutrition necessary for good health, so think about drinking a glass of semi-skimmed milk with that bar, or grabbing a very portable low-fat yogurt too. "And always read the nutrition information on the label before buying a meal replacement. Some bars are coated with sugar mixed with hydrogenated fat. When you're constantly on the go it can be difficult to stick to proper weight loss nutrition needs. Many people turn to nutritious bars for quick energy, snacks or meals, but which should they choose? It depends on your nutritional needs. Developed in the 80s for people engaged in high-endurance activities such as hiking or sports involving running, energy bars usually have a mix of simple and complex carbohydrates. Some have moderate-fat levels, while others contain quite a bit of fat. Many are vitamin- and mineral-enhanced, but those levels can vary widely between brands. Generally speaking, this is not a good choice for people trying to lose weight unless they're doing it combined with high intensity exercise. 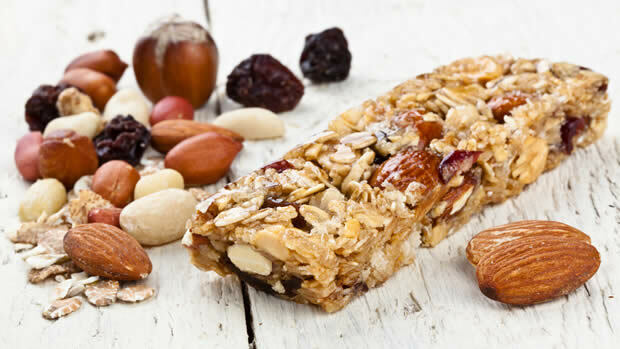 The line is fuzzy between energy bars and nutrition bars, but often nutrition bars have a bit less sugar and a little more vitamin enhancement. They can be used for meal replacements, but it's important to also incorporate fresh fruits and vegetables into meal planning. The best advice for purchasing a nutrition bar is to read the nutrition information on the label. If it has more sugar or fat than you're comfortable with, there are many other bars from which to choose. Also, many nutrition bars could not be considered a low-calorie or low-fat snack choice, although there is an increasing amount of low-carb nutrition bars. If you're tempted by a low-carb bar, have a quick look at the length of the ingredients list. You probably won't even have heard of three quarters of the ingredients so it's probably better to arm yourself with something a little more familiar. If you want a snack and a nutrition bar seems to be the best available choice, try eating just half of one and saving the other half for the next snack. The name is self-explanatory. These are designed to replace a meal so they contain a meal's worth of calories. However, they're easily digested so it's a good idea to pair them with a piece of fruit so you're not ravenous before the next meal. In conclusion, it's best to not rely too heavily on any of these types of bars for snacks or even entire meals. Having them a couple of times a week is ok as long as you don't allow them to stand in the way of a healthy balanced diet.